I guess I’d have to say Jo March. 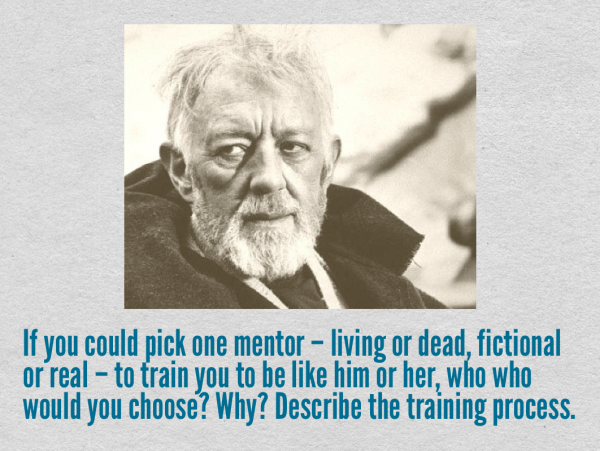 (Figures my ideal mentor would be fictional!) A writer, an amateur actress, and someone who is unafraid to whole-heartedly pursue her dreams and schemes, I could learn a lot from her. Sure, she could be hot-headed, but she learned to let her passion drive her without controlling her. I want her boldness. You could see it in the way she just picked up and went to New York all by herself because she needed something new. When her family needed money, she sacrificed her “one beauty” by selling her hair. Unlike her sisters, she wasn’t obsessed with finding herself a man (hallelujah!) but was still wise enough to recognize the right one. She’s practical and spunky and a whole lot of things I’d like to be. Standing, she’d act out her suggestion as I scribbled my own notes. It would be brilliant of course — her suggestion. And she’d keep pushing me, with ideas and challenges until I was exhausted but certain my manuscript could be no better. She’d give me tips and commiserate when I got bad news. And by commiserate, I of course mean she’d rail against the idiot publisher and what a stupid move it was for them to turn me down. And she’d be the first to rejoice with me when it did happen, shrieking with glee. We’d take a moment to celebrate before she pushed me toward the next book. Because that’s what mentors do: encourage, challenge, and, when needed, push. There you have it. Jo March, my dream mentor. What about you, how would you answer this prompt? Don’t listen to everyone else–I still like you. I’m sorry everyone is annoyed with you right now. They get tired of the cool temperatures easily. The novelty of snow has worn off now, especially when meteorologists predict it and it never comes. But it’s not your fault that they get paid whether they’re right or wrong. But I still like you. I like you because I haven’t forgotten what the summer heat is like, how it makes me feel like my skin is going to melt right off. I haven’t forgotten how the humidity wraps around me like a thick, wet towel in a sauna. Everyone else’s memories may be short, but mine is not. So I still like you, winter. I like the chance to wear thick wool coats and cute knitted hats and fabulous boots. I like having a steamy cup of coffee by a cool window. I like the way your morning sunlight looks so tentative as it tiptoes into the sky. I like you, even though the highs the rest of this week won’t even edge close to above freezing. I’m okay with that. I know sometimes you gotta freeze people out, take some time for yourself. I’m not daunted. I get it. I’m not upset. I’ll be prepared. Yep, I like you, winter. When everyone else is sighing about you and wishing you’d go away, I’ll be here, cheering you on.